"I was in 3 YORKS from 1981-1989 (Private – Captain). 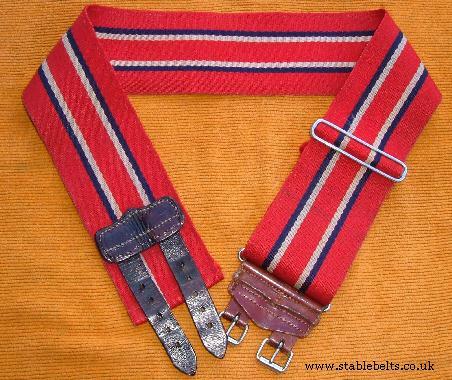 The belt is similar to 2 YORKS belt, but with dark blue instead of green. (It was sometimes confused with the CCF belt, but 3 YORKS had white rather than sky blue).There was later a move to standardise the stable belt across all 4 Battalions so that we all wore the same as 1 YORKS. 2 YORKS generally refused to play ball and continued to wear their own belt, but 3 YORKS and later 4 YORKS (when it was formed) wore the same as 1 YORKS. This makes the 3 YORKS belt the shortest-lived and rarest of the YORKS belts. I was in 4 YORKS (4th Bn Yorkshire Volunteers) when it was formed and they never had anything but the YORKS (i.e. 1 YORKS) belt. There was also a merged Battalion called 3/4 YORKS due to defence cuts and often referred-to a three-quarters YORKS.They wore the YORKS belt."